This 5-hour Blue Cave kayak and snorkeling adventure takes you to one of Montenegro’s must see coastal spots, locally known as Plava pilja (The Blue Cave). This is a great place for swimming, snorkeling and underwater photography, this geological attraction can only be accessed by boat or by kayak. 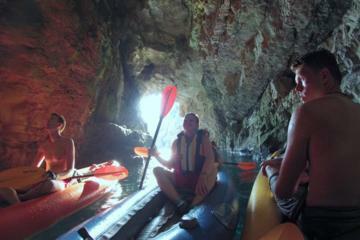 Also, we visit a number of secondary nearby caves that can only be accessed by kayak.